Your vehicle is equipped with a glow-inthe dark emergency trunk release lever located inside the trunk. It will glow after the trunk is closed. When pulled, this lever will release the trunk latch mechanism and open the trunk. 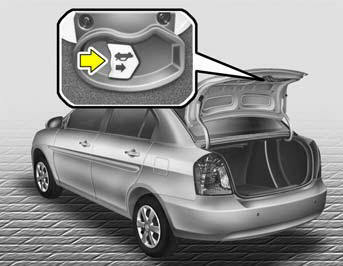 o If a person becomes locked in the trunk, pull the emergency trunk release lever of the inside panel in the trunk to open the trunk lid. o Keep cars locked and keys out of the reach of children. HYUNDAI recommends parents teach children about the emergency trunk release lever in their vehicle and how to open the trunk lid if they are accidentally locked in the trunk.